After not seeing two of his friends who he met in the U. S. Navy several decades ago, Bob Barth of Neillsville finally had the chance to meet with his buddies in late June. Barth who was a jet mechanic in the aviation part of the Navy, left the service in September 1968. 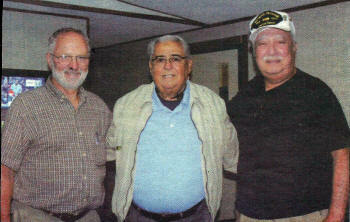 It was the last time he saw his friends, Jose Savala and Alvino Garcia, for five decades. The three were based in San Diego, CA. They were deployed to the Gulf of Tonkin together and then the Sea of Japan following North Korea’s seizure of the American spy ship USS Pueblo, which has still not been returned to the U. S.
Barth searched for several years for his old buddies and went to search engines to track down Savala and Garcia. He was able to narrow down the search by age and by searching in the Texas area, which he believed both men were located. He found eight people in Texas with the name “Alvino Garcia”. He wrote a letter and sent copies to each of the eight people in May 2016, requesting whoever was the person he served with to get in contact with him. “If you are the individual to which this letter is addressed and served with me or know this person, please contact me by one of the following means, so I might be able to renew our friendship after all these years,” Barth wrote in the letter. In the meantime, he had made contact with Savala, and caught up with him on the phone. However, in just a few months he found his other friend. “I got a call and the person said, ‘Hey Bobby,’ Alvino always called me ‘Bobby,’ so I knew it was him,” Barth said. After the chance phone call, Barth called Savala to tell him he just talked with Garcia. For about two years, the three buddies would stay in contact, periodically calling each other to chat. Then the three decided to meet up. “There was a bit of a rush, because Alvino Garcia has had some kidney issues and he is on dialysis three times a week,” Barth said. “We are all in our early 70s and health issues are popping up. “If something were to happen, I wouldn’t forgive myself if I didn’t go down there. Barth rode on an airplane to Texas and met Savala. The two of them drove together to Midland, TX, and met with Garcia on June 25. “It was extremely thrilling,” Barth said. The three long-lost friends shared stories and memories and had the chance to catch up even more in person after not seeing each other for 50 years. “We talked about families. They got to meet my family through pictures, and I got to meet their families,” Barth said. Barth said he thought a local newspaper would cover the reunion of the three buddies, but little did he know there would be more coverage than that. Garcia’s son and Garcia’s son’s wife both called local television stations to tell them about the reunion. “We had two TV stations come and talk to us,” Barth said. It was a continuation of a friendship that started on the VAW-115 aircraft and while the three of them were a part of an air early-warning squadron. 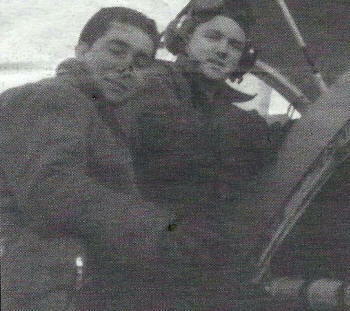 Jose Savala and Bob Barth (l-r) are pictured on their aircraft carrier in 1968. Alvino Garcia and Bob Barth (l-r) are shown on their aircraft carrier in 1968. “We were the eyes of the fleet, so to speak,” Barth said. Barth had not been the only one looking for his former friends. Garcia’s son is 41 years old. Garcia’s search for Barth and Savala started when his son was just 15 years old. “The three of us had been looking for each other for 25 or 30 years,” Barth said. Barth had about 15 people working for him at one time. In addition to Savala and Garcia, he found some of them and kept in contact with them. “I reach out to them on holidays and birthdays and special dates and we catch up,” Barth said. In August, Barth will turn 72 years old and Garcia will turn 71. On July 31, Savala will be 73. 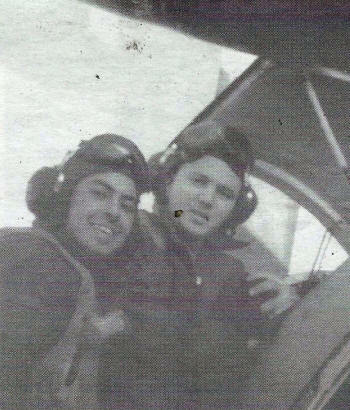 Garcia and Savala left the service in 1970.